I'm so excited to be giving away one of these super soft, luxurious throws from Saranoni Blankets today! This blanket is the perfect thing to throw over a chair, add to the foot of your bed or simply pull out of the linen closet for a late night popcorn + movie date. Love this beautiful color combo! Such a beautiful set up! I love that throw and that gorgeous chair! Love the overall color scheme! 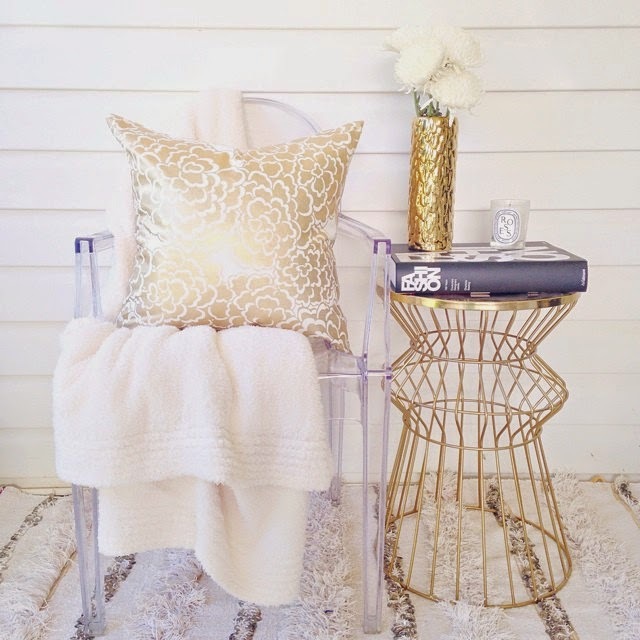 This is such a cute set up - I absolutely love your decor posts. This color scheme is so warm, and I am sure you made your guests feel so welcome! I am obsessed with white and gold, you decorate with it so well. Loving all the textures together!